Fine Art Shippers is a freight forwarder and an art logistics company combined in one. We have been shipping fine art since 1995 and providing a full range of art handling and art installation services since 2000. For today, Fine Art Shippers works with many prominent galleries and all the major auction houses in the United States. Moreover, in addition to our comprehensive art packaging and shipping services, we also have our own art shuttles going every other week from New York City to Miami and every month from New York City to Chicago. We also have a fully equipped warehouse at 1940 Mcdonald Avenue in Brooklyn, which serves as a short-term art storage facility and a crate shop where we manufacture art crates based on the exact dimensions of each transported artwork to provide it with the utmost protection in transit. Besides, at Fine Art Shippers, we have our own customs broker for import and export shipments in the United States. The same applies to the United Kingdom because we have a representative office in London, which was opened right in the Heathrow Airport area to facilitate any international shipments. Fine Art Shippers works with Sotheby’s, Christie’s, and other leading auction houses, picking up art for our clients and providing them with art packaging and shipping services worldwide. We ship all over the United States, Europe, Australia, Russia, and Asian countries where we also have offices and agents for customs clearance, white glove delivery, art installation, etc. No job is too small or too big for Fine Art Shippers, and we can pick up art from any part of the world, as well as we can deliver art to anywhere in the world. Furthermore, all our art packaging and shipping services are available at very competitive prices, making our company a preferred option for many art business professionals and individuals. 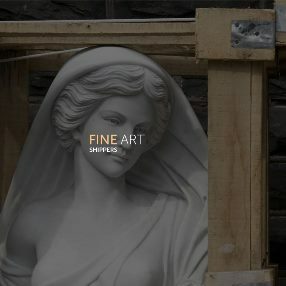 Fine Art Shippers has a lot of good references from many art galleries and dealers in New York City, Miami, Los Angeles, Boston, Houston, and Dallas. The same applies to many art museums and public institutions, including MoMA PS1, the Brooklyn Museum, the Museum of the State University of New York at Stony Brook, the Hyde Collection in Glens Falls, and the Rhode Island School of Design Museum in Providence, for whom we have also done much of art handling and art shipping work. Along with that, Fine Art Shippers is always ready to build new relationships and establish new contacts in the sphere of art logistics, and we never miss a chance to get more jobs from fine art galleries, auction houses, museums, art collectors, antique dealers, and cultural centers. It is also worth noting that in addition to standard art packaging and shipping services, we also ship fine art to many national and international shows, including Art Basel, Miami Beach Jewelry & Antiques Show, Art Miami, New York Architectural Digest Design Show, Palm Beach Show, Nantucket Art and Artisan Show, Art Market Hamptons, and many more. Plus, Fine Art Shippers is always interested in learning more about different opportunities in one way or another related to the art world. For example, we help new art galleries and upcoming contemporary artists, providing them with affordable art packaging and shipping services and helping them promote their art as much as possible. We love what we do, and we will be really happy to get a call from you, no matter whether you need our assistance in organizing an art exhibition for an emerging artist or want to ship your art overseas safely, securely, and on time. Fine Art Shippers is always ready to help!